flickr.com/photos/dr_hamza/sets/7215762... recent pictures from Misrata approx April 1 2011 or so. 4/23 www.nytimes.com/slideshow/2011/04/23/wo... Captured soldiers loyal to Col. Muammar el-Qaddafi in a pickup truck outside a Misurata hospital on Saturday. Cool FF Cap – I want one! Al Jazeera English’s Flicker photostream – over 2000, not sure if they are all Libya though. Lubna – child in Misrata, lost an eye, still standing for the revolution…. 4/28 C.J. 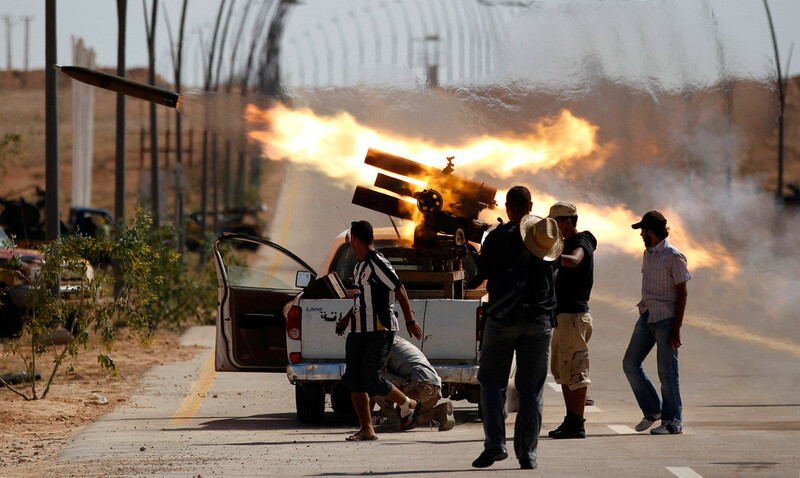 ChiversPics from Misurata and its Outskirts: Keyholes on a Siege. 5/10 Epic Libyan Freedom Fighter martyred. flag of all arab countries sewn together unfurled at gethering – Benghazi?? not sure. twitpic.com/50mw0a – after injury etc. 5/23 BENGHAZI billboard – We Have a Dream! May 24, 2011. A destroyed tank belonging to forces loyal to Muammar Gaddafi is seen near Misrata’s western front line, some 16 miles from the city center. May 26, 2011. Rebel fighters take part in training in Giminis. The government of Libyan leader Muammar Gaddafi has contacted foreign states offering an immediate ceasefire, but there was skepticism that the proposal could end the three-month-old conflict. May 21, 2011. In this photo taken on a tour organized by the Libyan government, soot is wiped from a Moammar Gadhafi poster in a building that was bombed and burnt earlier this week, in Tripoli, Libya. Officials said the offices in the building were used to follow up on corruption cases against individuals and ministries. May 22, 2011. Destroyed mannequins litter Tripoli Street in Misratah, Libya. 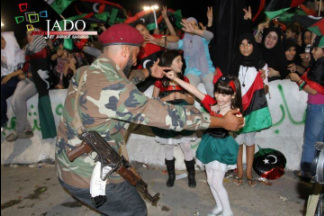 The port city has sustained some of the heaviest fighting between rebel forces and troops loyal to Muammar Gaddafi. Many shops remain closed amid the violence. 5/26 Artistic flag and fallen green book statue – city? Photo: #EpicLibyanMan wins minesweeper champion of the universe. The president is just a guy that works for us. Young girl from a protest yesterday in Jadu. I bet she has a few words for Gaddafi & co.
Classroom in Yefren were students are learning Tamazight, a language forbidden to be taught under Gaddafi. How much credit does Q have….. Here's the beginning of the photos - there are hundreds. Tabs at top click to other weeks, through week 20. Then goto this link for week 21 onward. Then goto this link below for week 21 onward. 7/17 A simple pic … but says so much…. 7/20 Sunday Bloody Sunday U2 Concert in Meadowlands with Free Libya Flag Colors etc. 9/26 Incredible Reuters picture from Anis Mili showing the moment an RPG is fired. "The infamous guy who took #Gaddafi's hat - friend of my cousin, says he is never going to return it ever"
w a comment: "he's our neighbor he deserves the hat he risked his life so all Libyans could live free"
9/28 Stomping on Gaddafi's face under the driver's footpedals of some vehicle.... "I want one in my car!"